Resist Trump's sham voter commission! The Commission on Election Integrity’s attempt to collect voter data violates voters’ privacy and security, and I am concerned it could cause the wrongful removal of eligible voters. 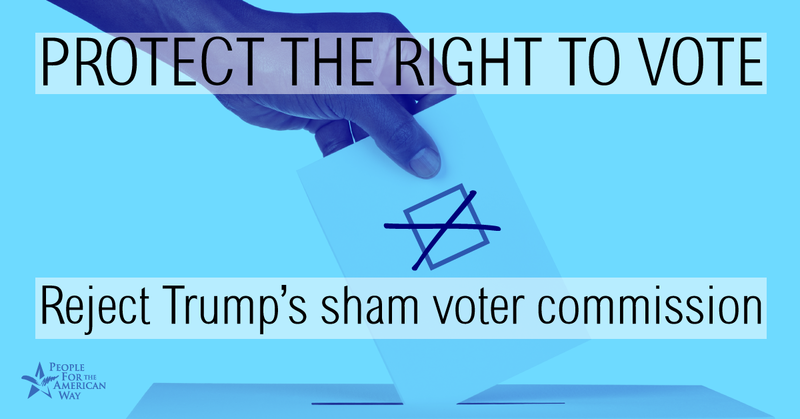 Resist this sham commission’s collection of data and refuse to share voter information! Donald Trump escalated his voter fraud witch-hunt—based on his unsubstantiated belief that voter fraud cost him the popular vote in 2016 -- by convening a "Presidential Advisory Commission on Election Integrity" headed by notorious voter suppression advocates. Now he’s using this commission to lay the groundwork to suppress voting rights, and the “experts” on his commission are demanding private voter data from state election officials, including names, dates of birth, voting histories, party identifications, and parts of voters’ social security numbers. There are SERIOUS concerns with the information the commission has requested -- not only is it a breach of voters’ privacy and security, this information could be used to target voters for suppression. Please join us in calling on state election officials to REFUSE to share voters’ information with this sham commission.